I am very late with this post and I do apologise in advance! I have had so many things going on over the last a few weeks with events to attend, beauty shows, work and just general life as well. On top of that I just haven't had the time to carry on with my 'Blogging tips series'. Plus I did not want to write a post without giving my 100%! I have already done a few posts on photography tips which you can have a read here. Now to carry on with my blogging tips series, I have decided to focus on 'Blogger' - a platform which I use to host my blog. I am really sorry if you use Wordpress, however I am not familiar with it and in all honesty I did Alevel Information Technology and I still did not know how to use Wordpress when I first started so quickly moved my blog to Blogger before anyone knew about it! Having your own domain name is very important if you want to take this blogging world seriously. Before when I was www.eeshasglam.blogspot.com I was never approached by PR companies however since I have brought my own domain name I have had many opportunities to grow as well as work with a few brands. 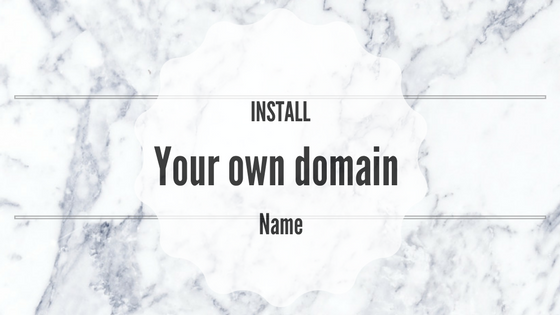 Also having your own domain name gives you that ownership of your own blog! 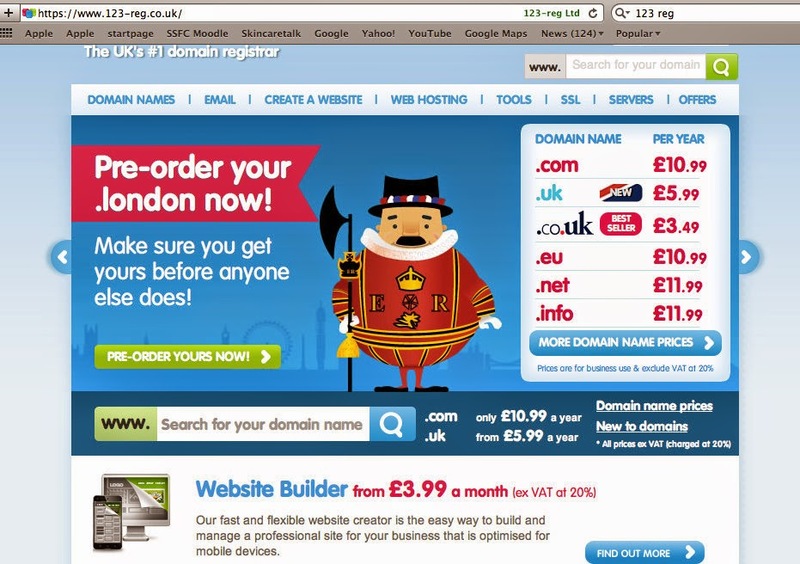 Firstly, you will need to buy your own domain name. You can do this through Godaddy or 123-reg. I personally use 123-reg only because I found it easier to add privacy protection which Godaddy for some reason where not offering me when I tried to buy my domain name from them. Privacy protection is VERY IMPORTANT. I repeat VERY IMPORTANT. Unless you want your details such as name, address, telephone number showing up on Whois. If you visit Whois website and type in a web address such as mine 'www.eeshasglam.co.uk' you will see my information is hidden. However you type in another web address maybe even your favourite blogger and if they have not used privacy protection you will be able to see all their details. (sorry can't give you an example for confidentiality reasons) Scary right? You don't know who maybe searching up your web address and trying to find out where you live etc. Next type in a domain name you want. 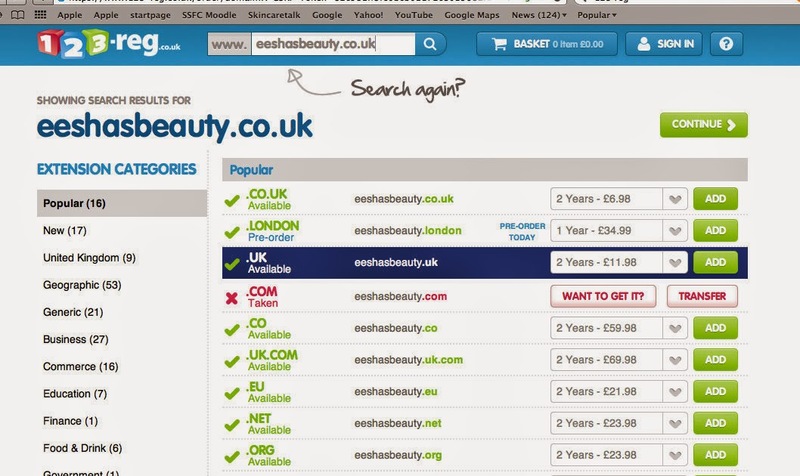 Mine was of course already taken so I choose 'www.eeshasbeauty.co.uk' to show you guys as an example. 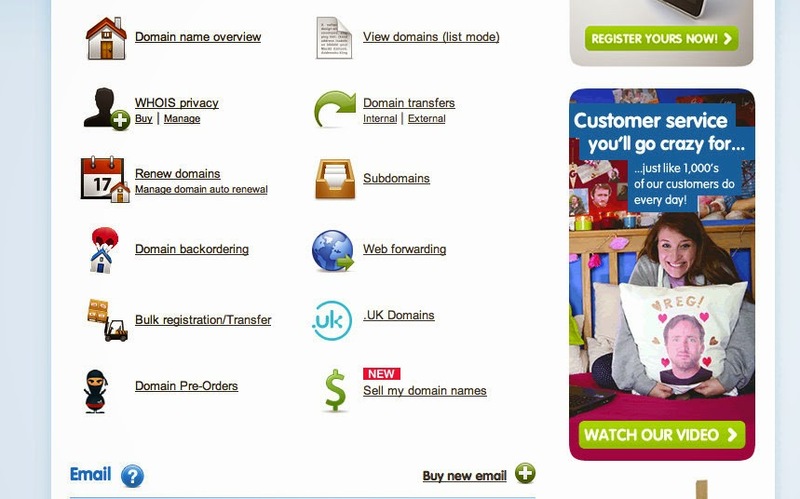 The next page will show you options of different domain names which are available. 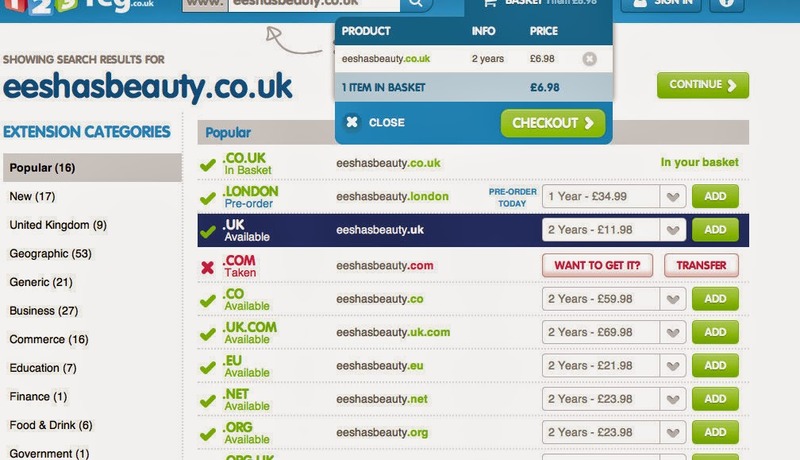 Sometimes .co.uk may not be available so it may give you other choices such as .com or .net so you decide which one you want and then decide how many years you want your domain name for as the prices vary depending on that. Then 'ADD' it to your basket. 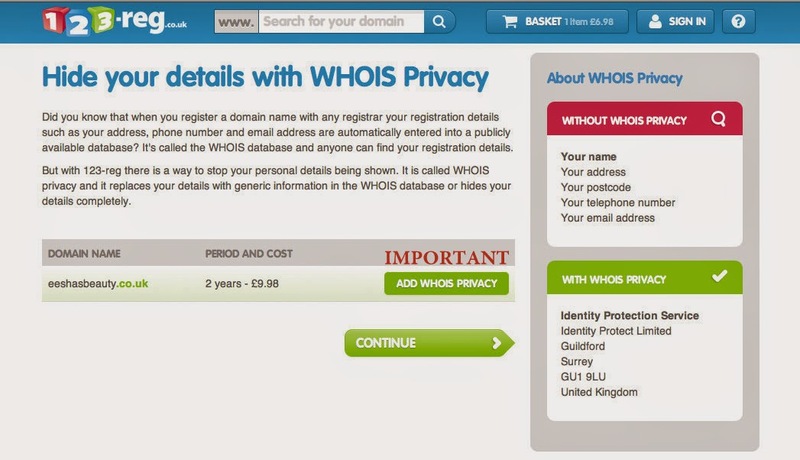 Next page is the important one where you add your whois privacy. Eventually it is your decision if you want to pay the extra money and add it on however I will definitely recommend it. Now once you have added everything and clicked on 'CONTINUE', it will take you to the sign in/register page, fill in your details and register. Then fill in your payment details and once the payment has gone through you will be able to log in to your account. So once you log in this is the page you will see... Minimise it and open a new page. Add your new domain name here by clicking on 'Add a custom domain' make sure to use www in order for it to work... under publishing blog address tab. Mine's already been added as I have already installed mine. Now when you click save you will get an error message and two CNAMEs listed below. Each CNAMEs name will have a 'Name', 'Label', or 'Host' and a 'Destination', 'Point' or 'Target'. The first one is the same for everyone so Name = www and Destination = "ghs.google.com." and then the second one is personal to your own account and will be different for each person. Go back on to 123-reg website, the page we minimised before. 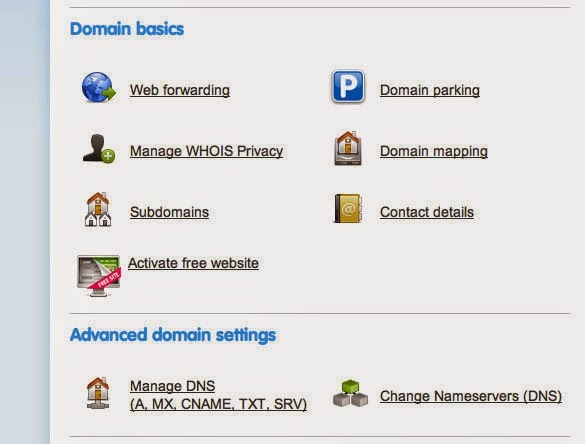 Next to your domain name you will see 'MANAGE' click on that. Now it is time to enter CNAMEs names. Where it says Hostname type in 'www' and where it says Type - select CNAME and then for Destination type in ghs.google.com. << make sure that full stop is there. Then click Add. Now add in your personal CNAME name. Using the same format. So copy the Name into Hostname, then choose CNAME for Type and then copy the Destination link. Once again click add. Now if you want visitors to visit your page without using 'www' you will need to copy these A links...if you do not use this as it is optional it just means if someone types in for example 'eeshasglam.co.uk' and leaves out the 'www' then they will get an error message. So put www for Hostname and the Type is A now for destination copy and paste these codes from below. Now thats it! Just click on save. Go back to blogger and once again go to your blogger dashboard, click on settings and basics. Find publishing tab again and click on 'Add a custom domain' now enter your own domain name url, this time there should be no error message so just save and there you go! Just remember it can take up to 24 hours before it starts working. Hope this post has been helpful. If you have any questions just let me know and I will get back to you as soon as possible! Disclaimer - I brought my own domain name and paid for it myself. This is not a sponsored post. 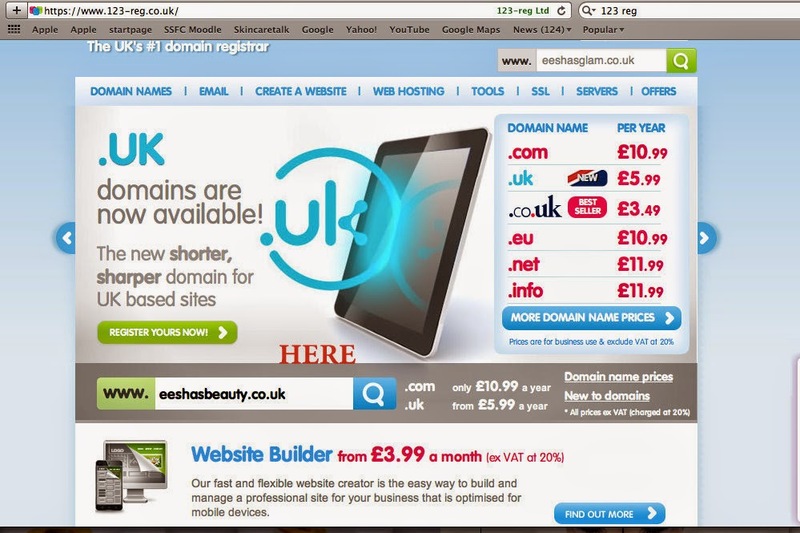 Quick question.. if I do buy a domain name would I still be able to use the blogger features? This post really helped me out, would have never been able to work out custom domains without it.. thank you:)! The whole privacy thing is really scary, I signed up for Go Daddy without researching it properly and so didn't have the privacy setting available. I guess I'm kind of lucky because I live in an apartment building, so I've changed my details to not include my actual flat number. It's not perfect, but it at least makes me feel a little safer.